This book contains over 1,500 provocative statements and related questions to inspire you to step into leadership conversations. It will kick start conversation with your team, or in one-to-one scenarios. The questions are also designed for self-reflection as a leader (perhaps its most powerful purpose). Arranged under alphabetical topics, you can flick through this book and quickly find a question that relates to whatever situation you find yourself in—a question that will make you think and invite you to look at your situation from a different perspective. A recommended every-day resource for leaders everywhere especially those building conversation cultures in their company. Aileen Gibb is a Scottish-born Canada lover who spends her time between her Scottish homeland and her adopted home amid the Rocky Mountains in Alberta, with her husband and boxer dog. Aileen is known as an inspirational coach, leader, and facilitator of conversations with leaders and teams around the world. She inspires new possibilities in people from all walks of life and believes profoundly that when obstacles are met, there is "always another way." Her writing springs from her work listening to, and asking questions of, people to uncover new and inspired futures. It is clear that her passion and calling is to promote self-leadership, healing, growth, and community, and to empower others to do the same. 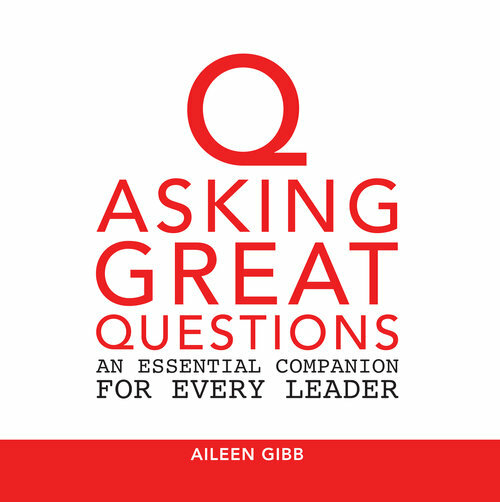 Her most recent publication Asking Great Questions is an essential companion for every leader who seeks to inspire through meaningful conversation and connection with others. It is a beautifully designed book that invites you to pick it up, browse through it, and be inspired by one of the 1500 questions and provocative statements contained in it's easy-to-read pages. It has been said to start conversations that are waiting to be heard.